Your little Frozen Fan can dance around into a winter wonderland with this Anna Deluxe Costume. Beautifully detailed with its satin bodice with glitter artwork, shimmering stretch side panels, golden brocade scalloped trim, and black and gold braided ribbon detailing. 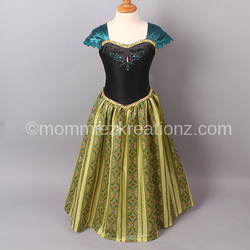 This dress will take your babygirls imagination on an adventure to Arendelle.